A car involved in an apparent hit-and-run with a couple on a tandem bicycle was being followed by police at the time, it has emerged. 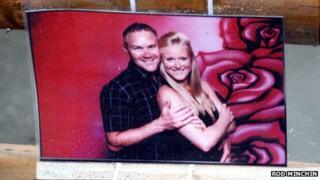 Ross Simons, 34, and his wife Clare, 30, died at the scene of the incident in Hanham, near Bristol, on Sunday. The matter has been referred to the police watchdog, the IPCC. Police arrested a 38-year-old man on suspicion of causing death by dangerous driving and a 35-year-old woman, on suspicion of dangerous driving. In a statement, the families of the couple said they were "completely devastated". They added: "A very special couple have been taken from us and we have no words to describe our loss." Meanwhile friends said the couple had desperately wanted children and had just been given the go-ahead to start IVF treatment. Avon and Somerset Police said an officer was alerted to a Citroen Picasso travelling along Lower Hanham Road at speed, shortly before 16:00 GMT on Sunday. A spokesman said the officer indicated to the car to stop but it made off. The officer began to follow the car but lost sight of it. Police said that shortly afterwards the car struck another vehicle and then collided with the cyclists. They confirmed the Independent Police Complaints Commission was investigating. Friends of Mr and Mrs Simons said they had been married for about 18 months and had been together for several years. Diane Pullin, from Kingswood, said she got to know the couple because her son-in-law Darren worked for Mr Simons' father. "They are a lovely family, so kind and so helpful," she said. "They don't deserve this. They'd just had news that they were able to have fertility treatment... everything to live for. "It's just terrible and it shouldn't have happened. "Two young people with their lives in front of them... snapped away just like that." Mrs Pullin said her daughter Shelley and her husband had been out for a meal on Saturday night with Mr and Mrs Simons. "They desperately wanted children and it wasn't happening," she said. "They'd just been given the go-ahead. They were so happy on Saturday night. Image caption The Reverend Peter Cook said the incident had "ripped the community to its heart"
"My daughter says she's got helium balloons at the top of her stairs wishing them luck and she can't even look at them." Speaking after laying flowers, family friend Steve Camm said: "They were like two peas in a pod. "They were never apart. They could never do enough for anybody. They were caring people. "They always did random stuff. You could never stop them from having fun." And the Reverend Peter Cook, of Hanham Baptist Church, said the incident had "ripped the community to its heart". He said: "I was just told about it when I was about to start my evening service and I really thought the person telling me was having me on. "We stopped the service and prayed for what was going on - it seemed just so implausible." Insp Frazer Davey said: "Following investigations overnight the circumstances of this collision have become much clearer. "However I would appeal to anyone who witnessed this incident or saw this car in the area shortly before the collision to come forward and contact us."